Gluing your completed puzzle together is a wonderful way to keep your puzzle for a lifetime. It transforms the puzzle into one seamless piece, showcasing your finished puzzle that took you hours to complete. It is also a great conversation piece, creating an original piece of artwork in your home. While gluing a puzzle may seem like a complicated task, it’s actually a very easy, affordable, and even fun project! Place the wax paper underneath the puzzle and use a rolling pin to ensure that the puzzle is as flat as possible. Pour the glue on top of the puzzle and then use a piece of cardboard or a business card to spread the glue evenly over the puzzle. The brush on Springbok’s puzzle glue is good to use for spreading the glue on the edges of the puzzle. Make sure you cover all the pieces. You might notice some air bubbles, but these will typically shrink as the glue dries. However, be careful not to brush or sponge too much glue onto the puzzle at once, as this could over-saturate the puzzle and the puzzle may swell or peel. Allow your puzzle to dry thoroughly before handling it. It can take up to 4 hours for the glue to bond, seal, and dry. After the glue is dry, you should be able to pick up your puzzle and you can use a ruler or spatula to separate the wax paper from back of the puzzle. To hang your puzzle on the wall, we recommend mounting it to a backer board. This rigid board will ensure your puzzle does not warp or fall apart. Your local craft store can help you with “Dry Mounting” your puzzle, which uses a special backer board that has heat sensitive adhesive that will glue your puzzle to the board instantly. The cost for dry mounting is typically around $15.00. Alternatively, you can mount the puzzle yourself. Position your glued puzzle on the backer board and then draw an outline lightly with a pencil, just inside of your puzzle dimensions. This will ensure that you hide the backer board behind the puzzle. Cut the foam board, using your ruler and razor blade to cut a straight edge. Glue your puzzle to the backer board using the spray adhesive in a well-ventilated area. Next, you are ready to apply the puzzle to the board. Spray adhesives dry much faster than liquid glue, so be sure to read how long you have before the glue sets. Once you have laid down the board, get out your rolling pin to roll over the puzzle to ensure that it adheres securely to the board. If you have a larger puzzle, you may need to apply some weighted objects to make sure that the puzzle presses flat against your board. Allow the glue to dry and the mounting is complete! There are a few different methods you can use to hang up your puzzle. 3M picture hanging strips are great for hanging without putting holes into the wall and are strong enough to hold the completed puzzle. Alternatively, you can create your own wire hanger to hang the puzzle. Purchase some 20-gauge craft wire to make a traditional wire hanger that will attach to your board. Cut two small holes on each side of the board, a few inches from the edge and halfway down from the top. Run the wire through one hole and run it with some slack down to the other hole and back out and tie a small knot at the end of your wire and gently pull until the knot sinks into the foam board. Making sure you have some slack like on the wires of a regular picture frame, cut the excess wire leaving enough room to tie a knot and pull it into the foam board again. When hanging your puzzle, the wire acts as a self-adjusting hanger, allowing you to balance the frame evenly. If that sounds like too much work, you can always buy a puzzle frame! 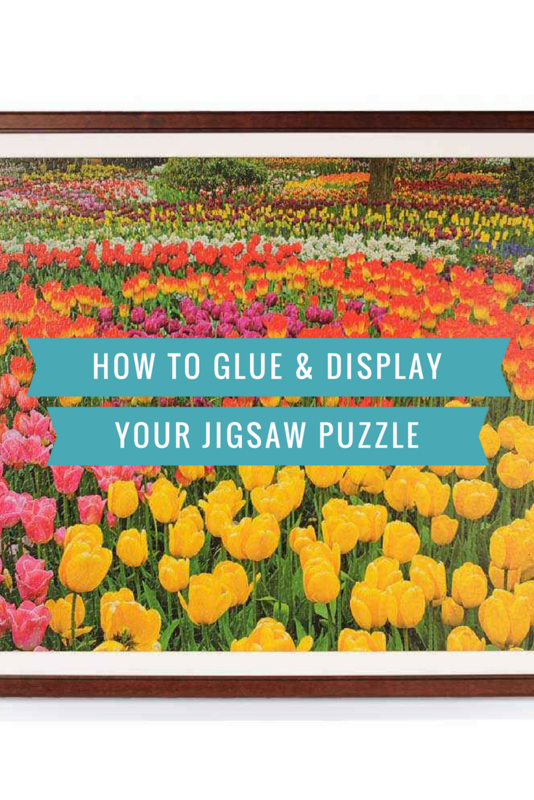 You can take your glued puzzle sandwiched between two pieces of cardboard to protect it in transportation to your local craft store. We recommend first dry mounting your puzzle or mounting to foam board before framing to preserve the puzzle. You can however, glue your puzzle at home, find a frame that fits and frame the same as you would frame a poster if you wish. We recommend that your puzzle is covered with glass or a transparent plastic sheet in the frame, as this will cover and protect the puzzle from fingerprints or scratches, as well as secure your puzzle within the frame.